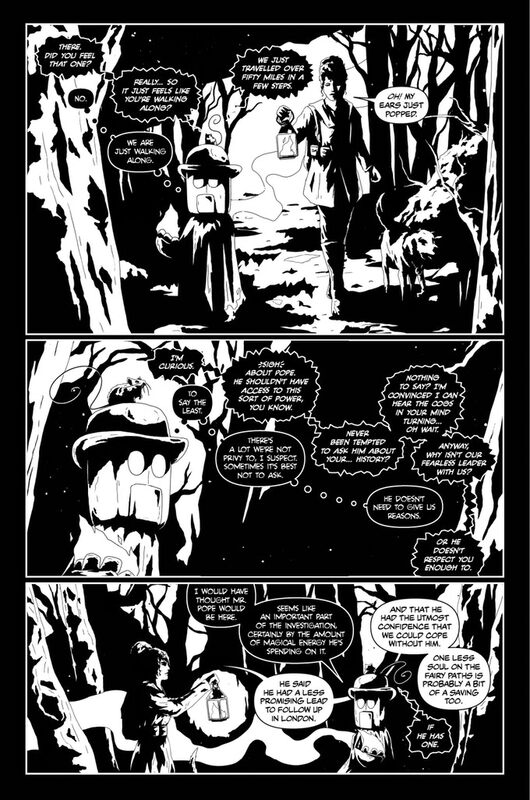 Posted on May 3, 2018 by thelostlighthouse	in Comics, Literature and tagged art, Cognition, comic book reviews, comic books, David Hailwood, indie comic review, indie comics, Ken Reynolds, Literature, Lizard Men, Sam Bentley, steampunk, TLL. Set in Victorian England, Cognition combines steam punk with the occult and mystery to deliver a cast of steam powered robots, demonic mice, investigators and Shuck, the terrifying monster dog who recently joined their party. As with previous issues the interactions between the characters, the snark of Sigma the demonic mouse bouncing off the Cal the robot is a particular enjoyment of mine. The on-going investigation brings the team to the Welsh Countryside where they encounter Gwinddonod, a mysterious old crone whose tales of legend provide further insight into the investigation. 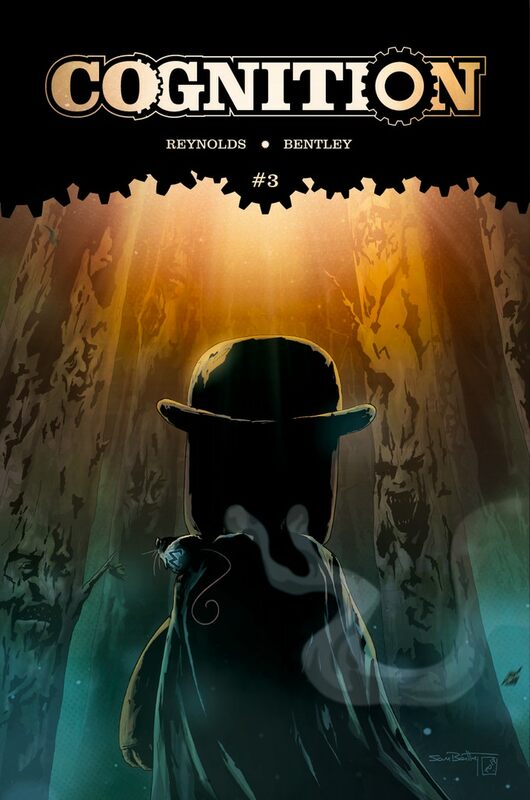 Reynolds’s strengths are certainly at play here as he delivers a narrative which hooks the reader in, with vivid language which Bentley turns into fantastic imagery. Bentley provides a unique and distinct art style which I cannot help but associate with the series. The black and white presentation adds to the atmosphere and sense of dread while also reinforcing the feeling that this is a tale from a bygone era. The two tone style could easily lead to a rather bland read, but Bentley manages to instead embrace it and provides a level of detail in the panels, particularly with the characters which evokes a sense of realness I wouldn’t have expected from the premise of the comic. One issue I did find is when I first read this comic as a digital PDF on my phone. I have a fairly decent size phone but I did fine the art was less clear when viewed one that sort of device and it made the story harder to get into. My second read on a computer screen was a totally different experience though, which lead to the praise I’ve given above. When you read this I strongly recommend either a hard copy or if a digital done on a screen which does justice to the comic. It’s also worth noting that Reynolds does an excellent job with the lettering, providing distinct styles for each character, which adds personality to how I imagined their voices in my head. I’ve seen Reynolds’s work on lettering in other comics, though I feel he’s at his best in Cognition. Kickstarter is currently open for this series (link here), and if it sounds like your kind of thing then get on there and back it. In my opinion this series started strongly and is continuing to improve as it goes. Check it out on Kickstarter and be sure to pick up the previous issues too. Have an indie comic you’d like reviewed? Get in touch with Kit at lostlighthouseindie@gmail.com!